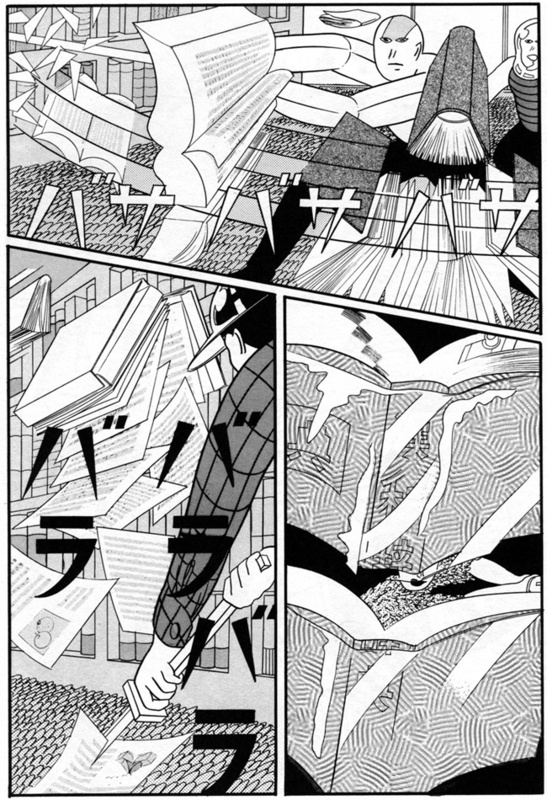 Yuichi Yokoyama is the most exciting comic book artist I have come across in recent times. His books are visceral action stories, and unlike most comics have a preoccupation with the exploration of landscape, transport infrastructure, terraforming and architectural space. His work is not widely available outside of Japan, but so far published in English are: ‘New Engineering’, ‘Garden’, ‘Travel’ and most recently ‘Colour Engineering’ (which I have ordered but not read at this stage). This prologue is the first of a series of posts looking at this series of comics. They will contain exerts of the books, but if you are intrigued, I urge you to track down copies from the excellent Picture Box press. New Engineering is a collection of his shorter projects, published in 2007 and the first english language presentation of Yokoyama’s work. Although an english translation is not strictly necessary in appreciating these comics as they are almost entirely comprised of action and where there is dialogue spoken by the various protagonists populating his landscapes, it is perfunctory and rarely goes beyond a short statement such as “The project is a success” or “Now we are leaving”. 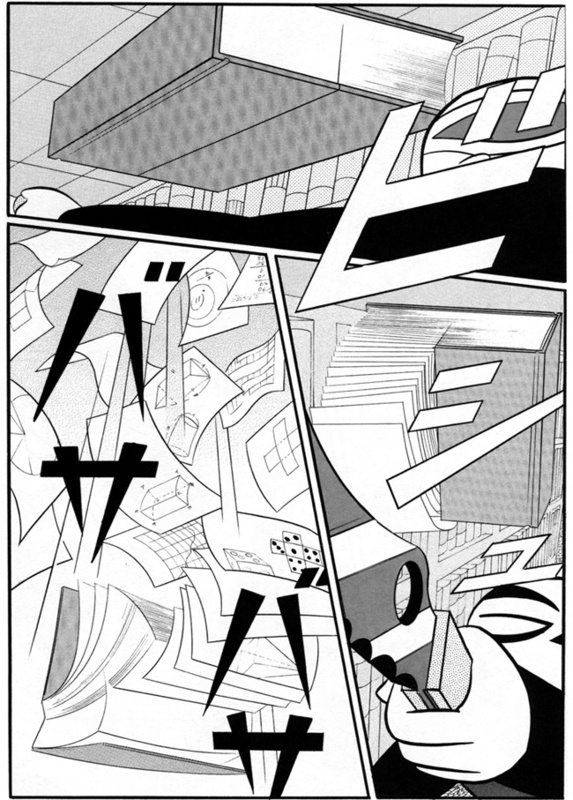 The comics consist almost entirely of action and sound effects. And the action itself fits largely within two categories: Making and Fighting. The ‘Engineering’ series that will follow concern the ‘making’ variety of these action comics, however as a first taste of Yokoyama’s individual brand of manga and as a way of positioning his work in the context of the medium, I will show off a few pages of ‘Books’; the first story in the collection. Books is fascinating and reads as a manifesto for Yokoyama’s approach to comics. The premise is simple; a samurai-like protagonist being attacked by five intruders wielding swords. He defends himself by hurling books at the attackers, which are cleanly dissected, sliced and diced by the swordsmen. 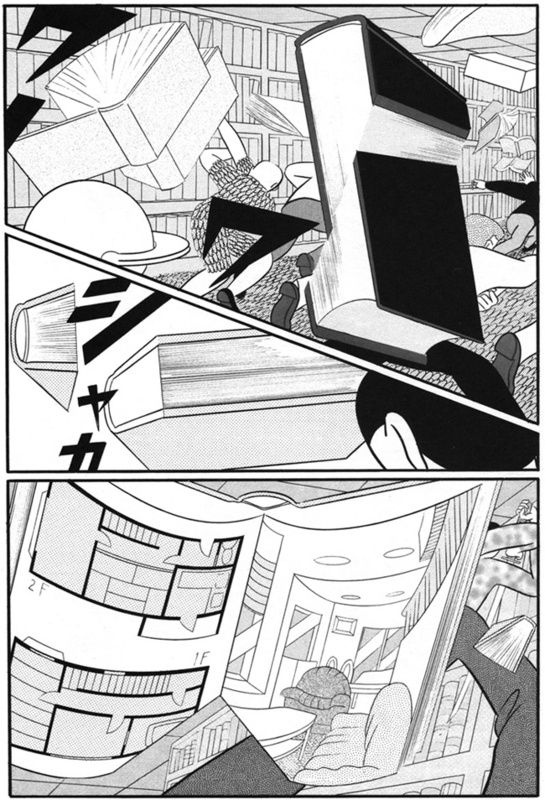 The books fly though the across the pages, through the panels, and then within the panels are split into their own subset of sequential images. 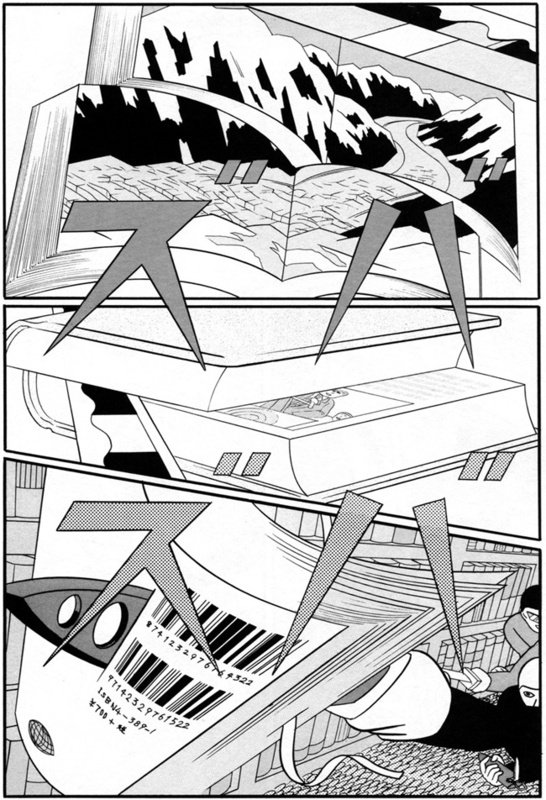 This is Yokoyama describing the act of comic making, splitting pages into components. 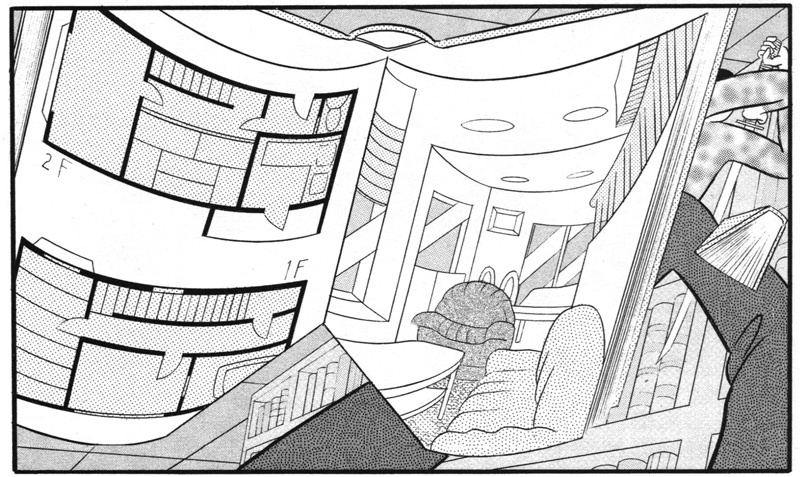 The panel layout of the comics that follow Books are often cut through on the diagonal, and the ever present sound effects provide further cuts across the pages. Next up, the ‘Engineering’ series.